A long summer of tough commutes for Metrorail riders will start June 4 with 13 straight days of single-tracking in one section, the agency said as it revealed its updated SafeTrack maintenance plan Thursday. The first project will be single-tracking on the Orange and Silver lines between Ballston and East Falls Church starting June 4 and ending June 16. That means reduced service for the entire Orange and Silver lines, and a severe impact west of the Ballston station. The next projects may be among the most disruptive in all 15 projects of the entire 10-month rebuilding plan: The complete shutdown of segments of track on the Orange, Silver, Blue and Yellow lines. Starting June 18, the Orange, Silver and Blue lines will be shut down between Eastern Market and the Minnesota Ave. / Benning Road stations. Two stations will be closed: Stadium-Armory and Potomac Ave. That will last until July 3. July 5, the Yellow and Blue lines between Reagan National Airport and Braddock Road will be shut down until July 11. And beginning July 12, the Yellow and Blue lines will be shut down between Reagan and Pentagon City. Metro will provide shuttle buses during the shutdowns, but the transit agency said any travelers should consider alternative travel options. And the disruptions don't end there: SafeTrack requires five separate shutdowns of sections of the system and 10 spans of single-tracking. The dates stretch through the summer, the school year and into 2017, though Metro is pausing the massive maintenance work for big events including Wreaths Across America at Arlington National Cemetery and for the presidential Inauguration. SafeTrack is Metro's massive overhaul of its rail system. 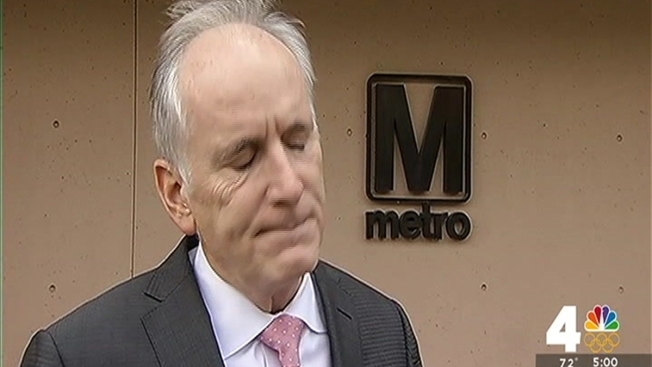 The plan has been championed by new General Manager Paul Wiedefeld, who has said that he wants Metro to prioritize safety over service. Wiedefeld has also said he will not reduce fares during the maintenance. Wiedefeld had rolled out an earlier version of the plan -- only to have to revise it after federal transit officials demanded immediate fixes to some sections of track. It's clear that SafeTrack will have a huge impact on Metro riders for most of the next year. In addition to the 15 projects that Metro detailed Thursday, stations will close at midnight to allow for more repair time. But SafeTrack follows a series of serious safety breaches on the Metrorail system. In January 2015, a Metro rider died in a smoke-filled car near the L'Enfant Plaza station. An investigation revealed that Metro regularly sent trains full of passengers into smoky tunnels to investigate the smoke. A string of nonfatal but still serious service and safety problems followed, including the recent fireball that erupted at the Federal Center SW station. 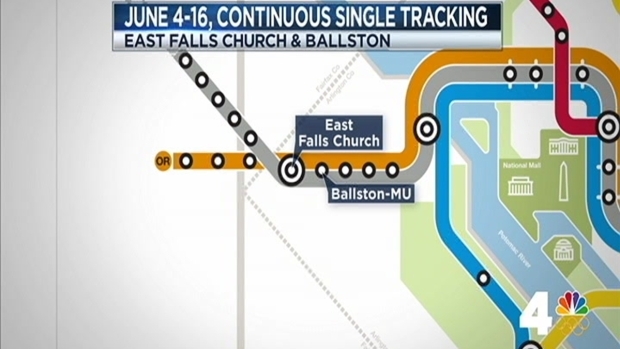 Continuous single tracking between East Falls Church and Ballston. Reduced service at most stations; severe impact West of Ballston. Line segment shutdown between Eastern Market and Minnesota Ave/Benning Road. Reduced service at all Orange, Silver and Blue line stations. Two stations closed: Stadium-Armory and Potomac Ave.
Free shuttle buses run between Eastern Market and Minnesota Ave. / Benning Road with stops at Stadium-Armory and Potomac Ave.
Line segment shutdown between National Airport and Braddock Road. Reduced service at all times at many stations, primarily Yellow and Blue lines in Virginia. Line segment shutdown between National Airport and Pentagon City. Reduced service at all times in many stations, primarily Yellow and Blue lines in Virginia. Continuous single-tracking between East Falls Church and Ballston. Reduced service at all Orange and Silver line stations. Continuous single tracking between Takoma and Silver Spring; reduced service at most Red Line stations. Continuous single tracking between Shady Grove and Twinbrook. Reduced service at Shady Grove and Rockville stations. Continuous single tracking between Franconia-Springfield and Van Dorn St. Reduced service at Franconia-Springfield and Van Dorn St. only. Continuous single tracking between Vienna and West Falls Church. Reduced service at Vienna and Dunn Loring stations only. Line segment shutdown between NoMa and Fort Totten. Reduced service at most Red Line stations. Continuous single tracking between West Falls Church and East Falls Church. Reduced service at all Orange and Silver line stations. Continuous single tracking between Greenbelt and College Park. Reduced service at Greenbelt station only. Line segment shutdown between Pentagon and Rosslyn. Reduced service at all Blue Line stations. Continuous single tracking between Braddock Rd and Huntington / Van Dorn Street. Reduced service at all Yellow and Blue line stations. Normal Service Jan. 14-22 for the Inauguration.